How many of us take for granted the comfort and safety our homes allow us? How many of us have thought of the check list of things we would take out of our homes in a fire? How many of us have even considered what it would be like to be driven from our homes never to return? Alone, hungry, and fleeing for our lives.This is the reality of refugees, the world's most vulnerable people. 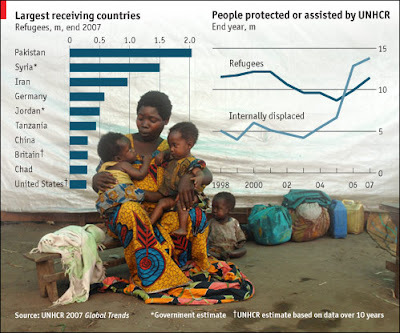 I'm going to borrow statistics from the UNHCR and it will make it clear the incredible need of our awareness and support to help the millions who are now homeless. The latest figures available show that the number of refugees of concern to UNHCR stood at 10.5 million refugees at the beginning of 2009, down 8 percent from a year earlier. The refugees of concern to UNHCR are spread around the world, with more than half in Asia and 22 percent in Africa. 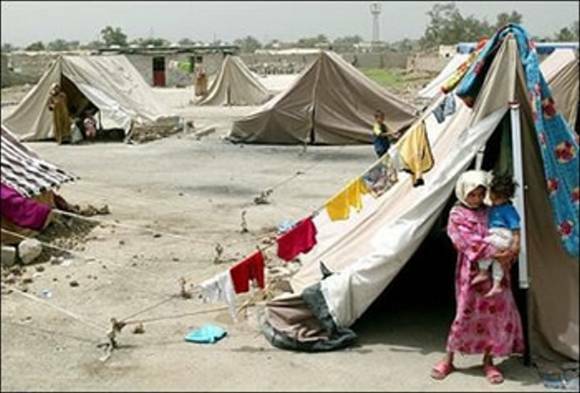 They live in widely varying conditions, from well-established camps and collective centres to makeshift shelters or living in the open. More than half of all refugees of concern to UNHCR live in urban areas. 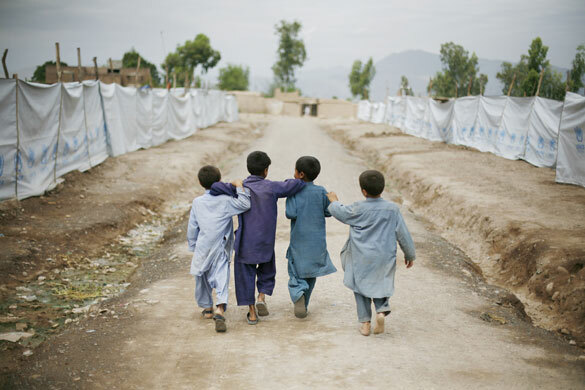 They all face three possible solutions: repatriation; local integration or resettlement. One of my favourite quotes by Noam Chomsky is in Imperial Ambitions. Noam Chomsky is an integral voice on foreign and domestic american policies, and one the world's most renowned intellectuals. I think this is an incredible reminder of our power and responsibility in this world. At the talks you give to American audiences you are often asked "What should I do?" Only by American audiences.I'm never asked this in the third world. When you go to Turkey or Colombia or Brazil or somewhere else, they don’t ask you, “What should I do?” They tell you what they’re doing. It’s only in highly privileged cultures that people ask, “What should I do?” We have every option open to us. None of the problems that are faced by intellectuals in Turkey or campesinos in Brazil or anything like that. We can do anything. But what people here are trained to believe is, we have to have something we can do that will be easy, that will work very fast, and then we can go back to our ordinary lives. And it doesn’t work that way. You want to do something, you’re going to have to be dedicated, committed, at it day after day. You know exactly what it is: it’s educational programs, it’s organizing, it’s activism. That’s the way things change. You want something that’s going to be a magic key that will enable you to go back to watching television tomorrow? It’s not there. We are people with freedom, wealth and opportunity. We are responsible for the direction this world takes. These mothers, fathers and children are no different from us, and they deserve our utmost respect and hard work to make this world safe for everyone. June 20 is World Refugee Day . Please do not ignore this global epidemic. We are one world and it is in our hands to make a difference. Do you have "One Day We Had to Run!"? I don't own a copy unfortunately!! I do have The Price of Indifference.